This verse was brought to my mind in a very literal and meaningful way last summer. Darin and I were hiking in the Porcupine Mountains. Our first stop was to see three waterfalls. The guide at the visitor center told us you could walk along a path and see all three falls. This was an easy, well-structured, boardwalk path. The guide had also mentioned that if we were so inclined, we could cross the river and see the falls from the other side, making a loop around them. That hike should have been about 2 miles. Along the trail, the path was marked with blue dots to help you know if you were on the trail or not. Well, as we discovered EVERY trail through the forest was marked with blue dots. What should have been a 1 to 1.5 hour hike of 2.3 miles, turned into a 6 hour hike of somewhere between 8-14 miles! We kept expecting to hit the turn-around point that would take us back around the falls. We came upon a couple of places where we had to make a decision about which way to go. We went the way that seemed logical to us. (Praise God, Proverbs 16:25 didn’t come to fruition here.). We ended up at the end of the trail by a primitive campsite on the shore of Lake Superior with no parking lot anywhere in sight. For quite some time, we had been questioning if we were on the right path, but we didn’t want to turn back because we were sure we had to be getting close to where we were supposed to be. When we reached that end point by the lake, I was overcome with a sense of fear. We didn’t know where we were and we were quite tired from the trek so far. 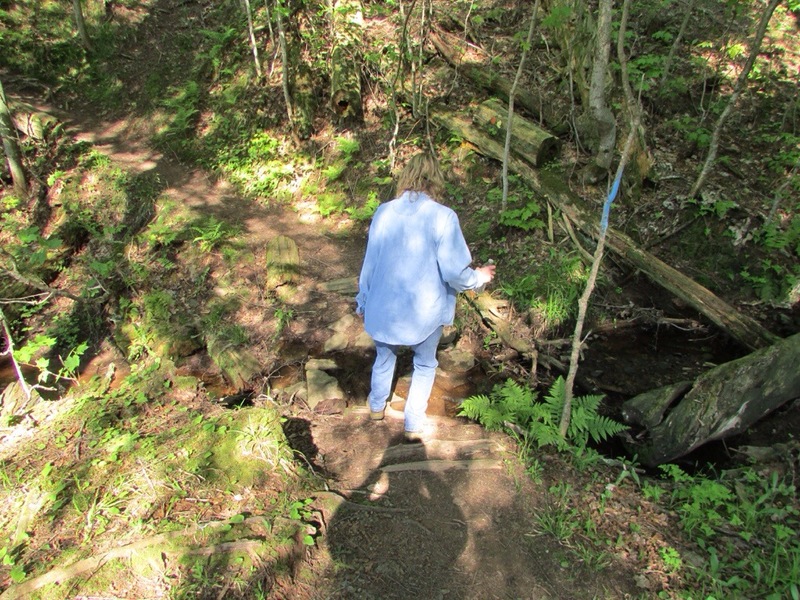 This had not been an easy walk in the woods, lots of ups and downs, crossing creeks and through swamps along this trail. The only thing we knew to do was retrace our steps and go back the way we came. An exhausting thought, but much better than spending the night in the woods. I am so thankful for my godly husband who stopped us right there and asked our Father to direct our path and lead us back to where we needed to be. He did just exactly that. He also gave us the strength and energy we needed to recover that rugged terrain. The sound of the rushing waters of the falls was more than welcome to our ears. When we heard that, we saw the point where we turned off the path we had wanted to be on and found the end of the loop we had originally meant to take. When the truck was within view, we paused to thank God for taking care of us. That experience last summer made me ponder how much life can be like that hike. Many things can lead us astray, while all the time we think we’re on track. Then, even when we realize something just doesn’t seem right, we try to continue in our own strength and according to our own wisdom, only to arrive at a dead end. Thankfully, our Heavenly Father is always available to us with His guiding grace and miraculous mercy. Be sure you know what/who is guiding you and know that the creator of the universe is always there to guide us through this world. He is THE One we should follow hard after.